Although we offer website design discounts when you choose hosting through our preferred hosting partner, you are free to obtain hosting with any company. We have partnered with Cart 32 hosting not to make money or as a reseller but because we want to extend reliable, hassle free and affordable hosting to our clients. WHEN YOU NEED AFFORDABLE, RELIABLE HOSTING FOR YOUR WORDPRESS SITE. Isn't your business worth $29 a month? Please contact us for a quote and recommendations based on your requirements. 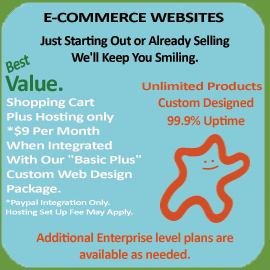 PCI compliant, E-commerce hosting plans with shopping carts with Paypal integration. Contact us for additional information.